You can assign a macro created in Excel 2007 to a custom button on the Quick Access toolbar and then run it by clicking that button. This provides quicker access to a macro than using the Macro dialog box. The Customize options appear in the right pane. 3Click Macros in the Choose Commands From drop-down list box. Excel lists the names of all macros created in the current workbook and those saved in the PERSONAL.XLSB workbook in the Choose Commands From list box. 4Select the name of the macro and click the Add button. 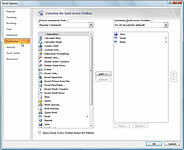 The macro appears in the list box on the right side of the dialog box. 5Click the macro name in the list box on the right and then click the Modify button. The Modify Button dialog box appears. 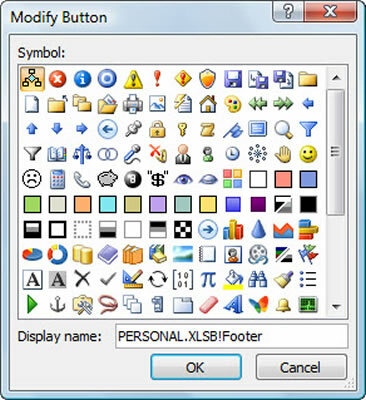 6Select an icon to use for the button. This is the icon that will appear on the Quick Access toolbar to represent your macro. 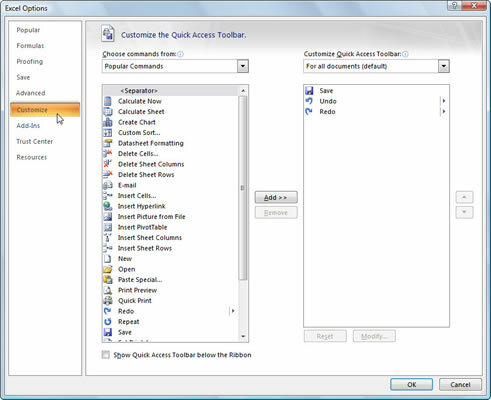 Both dialog boxes close and the macro button appears on the Quick Access toolbar.